A strange journey to Geeks Mania and the heart of the WJJO Sound Lounge. Late Monday night, I found out about a hastily announced concert taking place the next day. WJJO, an FM radio station best known for its selection of hard rock, was sponsoring an intimate performance by Underoath. The metalcore giants have been on tour behind the new record Erase Me. Recently, frontman Spencer Chamberlain and drummer/vocalist Aaron Gillespie have been visiting radio stations to play live shows as a stripped-down acoustic duo. Underoath has headlined festivals across the world and garnered Grammy nominations, so I was a little hesitant to catch them at the "JJO Sound Lounge," a movable branded event thingy, which in this case was located inside an arcade on the west side of Madison called Geeks Mania. Geeks Mania has a range of old-school games, a room full of pinball machines, and lots of generally geeky things. One thing that Geeks Mania does not do well, though, is hosting live music. The idea of the Sound Lounge, whatever it may actually be, was lost on Tuesday, or at the very least reduced to a drop-ceilinged room in the bowels of the large arcade. There was no exclusive space or sonic experience to be had. There were folding chairs in a corner of the building where tables for playing board games or collectible card games usually stood. The backdrop for the "stage" was a typical retail wall that had been plastered with random comic book paraphernalia as well as a JJO banner that was duct-taped up minutes before the show started. I arrived early to witness this oddity because the promotional material for the event was secretive and sparse, making me believe that the event would sell out. A Facebook event page was really the only promotion I found online; JJO's website listed the most recent Sound Lounge event as being in 2016. This event page spoke about this concert as if it would sell out. There was a maximum occupancy listed as well as a first-come-first-served policy for entry. The lack of advance ticket sales suggested a sense of spontaneity and urgency. Given the fact that the Facebook event was published only four days before the event, it seemed that JJO was aiming for something of a "pop-up" vibe. And, well, it popped up, but all too discreetly. When I arrived around 3:45 p.m. on Tuesday, there were around 15 people there for the show. The venue, as of 3:45 p.m. While waiting for the band to show up, it was clear that there was a lack of communication between the "venue" and JJO about what this event actually was. There were people waiting for the show to start sitting in folding chairs in a cornered-off section of the building. There were people there playing arcade games, rightfully so, and most likely unaware of what was occurring in the purported Sound Lounge. The Geeks Mania staff didn't seem to be engaged in promoting the fact that there would be a band there. Maybe the Jeep sitting on the lawn out front, covered in the JJO logo, was meant to help draw people inside, but just wandering into the building made that hard to believe. The ambiance of Geeks Mania, after all, is what you would expect in a commercial building filled with fluorescent lighting and arcade games. People who were clearly there for Underoath were sitting in the aforementioned chairs or wandering around playing games. The arcade itself had plenty of room for people and parties. There was also free pizza available specifically for the JJO Sound Lounge, but it wasn't the most attractive feature. In fact, these were some of the saddest room-temperature pizzas I've ever seen. It also could have been the neon lights in a room filled with air hockey tables, miscellaneous arcade equipment, and Pizza Pit boxes. I was surprised at how few people were there. It could be that I am a die-hard fan who has gone to multiple sold-out Underoath shows and was expecting to have a packed room for an exclusive performance. This was hardly the case. The energy was low and the location made it even stranger. I had to juggle deciding between playing pinball in a room that was nowhere near the stage and possibly missing a good seat to see the show, playing some Super Monkey Ball and keeping my eyes on the haphazard stage waiting for the duo to come in, or sitting and waiting for over an hour in a folding chair while listening to a live broadcast off JJO hosted by a DJ named Ozz. Listening to a live broadcast of JJO is not something I ever want to do again. The audience was subjected to the usual boring rock played on JJO and cute banter between Ozz and the crowd. Most of the banter consisted of repeated attempts to get people amped up to see the band, but the energy in the room was off, and the shouts of excitement were what you would expect from a room of around 20 people. The most surreal part of this experience was listening to someone read ads for a gentlemen's club featuring the Wisconsin Dells' "hottest water attraction" alongside a promotion for a happy hour in Madison while families played retro arcade games together and metalheads young and old waited quietly. By the time the music started, there were about 25 people present. The performance itself was very good. Chamberlain and Gillespie's acoustic renditions of "Rapture" and "ihateit" were refreshing and made for an intimate set despite the disconnected setting. But that was it—just two songs. I spent more time waiting in line for the Attack From Mars pinball machine to open up than I did seeing a band I've followed for more than a decade. Before each song, there were a few minutes of Q&A set up for the live audience, and some of my 24-odd fellow attendees actually asked some interesting questions, ranging from their favorite video games, the possibility of new music, and Underoath's turbulent relationship with being defined as a Christian band. During the Q&A session, Ozz became a bit more engaging and was able to spark some enthusiasm among the crowd and kept the conversation rolling. Fans heard about the band's history of living on the road since 2004, breaking up in 2013, and releasing Erase Me this past April. The conversation was fulfilling from the perspective of a fan, but again, I never thought that I would hear one of my favorite bands talk about the gritty reality of growing up as rock stars in the back corner of an arcade. At one point during the live Q&A, Ozz said that the audience that was there had either won tickets through radio call-in or through Facebook. While that may be true, I was a part of that audience and did neither of those things. I saw a friend on Facebook mark themselves as "Going" on the event page and fell down the Sound Lounge rabbit hole. Once I arrived, I followed signs for JJO/Geeks Mania down a long hallway and was greeted by staff who didn't seem especially aware of the fact that there was a concert going on. Again, something was lost in the sound of separation. The performance, Q&A, and a quick meet-and-greet wrapped up around 5:50 p.m.; the band, which didn't have a regular show booked in Madison this week, presumably went on to enjoy a night off. The Sound Lounge hosted a lengthy set of two songs. The Facebook page for the event clearly stated that the performance would begin at 5 p.m. and the arcade would reopen to the public at 7. If the organizers knew that the event would be brief, what was this extra time for? 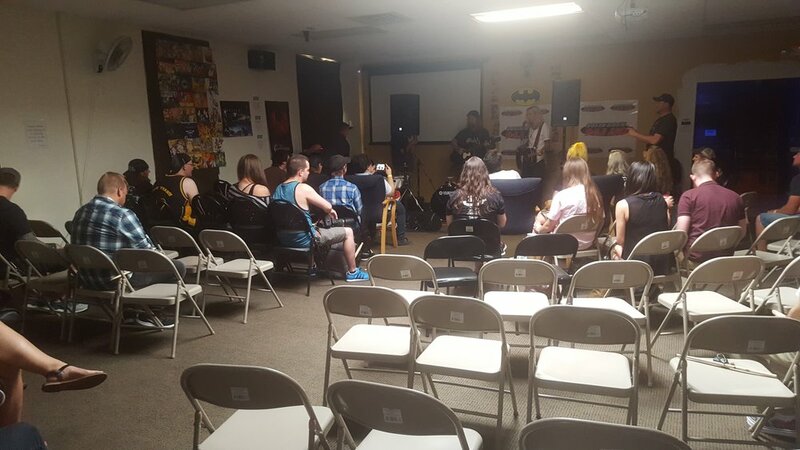 The majority of the fans decided to leave when the band they came to see left, and this left the JJO Sound Lounge looking rather deserted. Maybe the extra hour was for fans to listen to more of Ozz's live broadcast, but this was not a large appeal to most people there. It is also possible that this time was meant to be spent playing more video games, but as most people had already done so while waiting, it was time to leave. There is only so much time one can spend being mediocre at pinball. A part of me believes that this was all just a fever dream. Between the greasy pizza and acres of video games available, I felt like I was at a birthday party for a 12-year-old, where Underoath just happened to be playing. Granted, if this had been my birthday party when I was 12 I would have died from excitement. It could be the fact that I am older and not used to seeing a band of relative popularity performing in such an odd space. It could also be that this was an honest attempt to combine two fun activities, live music and arcades, into one messy being. The lack of communication and prep work could have been a consequence of the event being scheduled late, and perhaps the station did the best they could with the time they had. Underoath has been on the road non-stop the summer and finding the time to stop by radio stations is a tight squeeze. Perhaps JJO lured them into town with promises of video games and pizza. Disjointed as this last-minute arcade adventure was, I still enjoyed the chance to see a band I love in an intimate setting, and would be interested in the next life cycle of the JJO Sound Lounge, as long as it doesn't sound too much like an actual JJO broadcast. Underoath hasn't been to Madison in a while (ever?) and the fan in me is eager to jump at the bit for a chance to see them anywhere—but next time, not inside an arcade at 5 p.m. on a Tuesday, please.